Decorating doors and windows with Christmas lights on windows and doors can be a fun, creative, and festive way to celebrate the holidays. Don’t light a door or window itself. 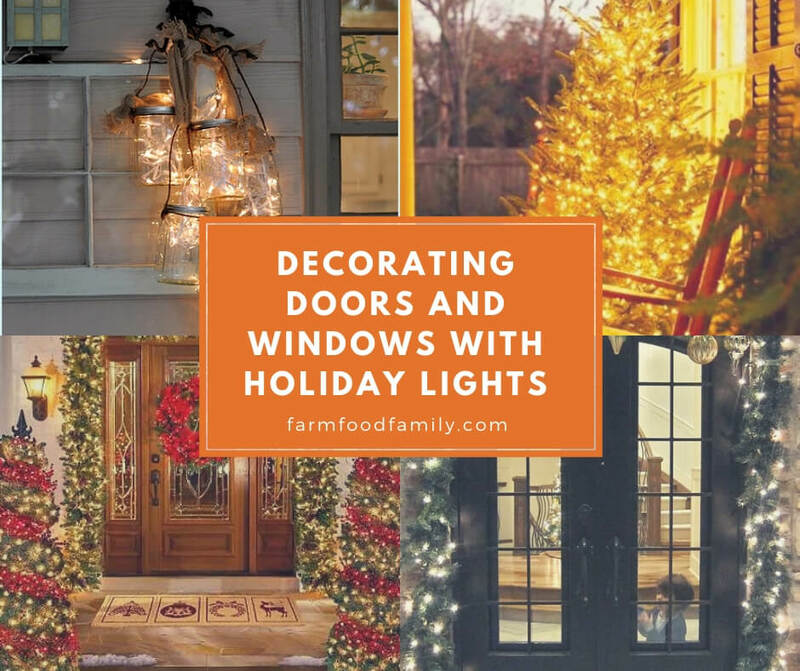 Opening and closing a light-bedecked window or door can make the lights swing and bang against its surface, yank a strand of lights out of its socket, or crack the bulbs. Instead, attach lights above and around doors and windows, on the cornices and casings. Choosing the right kind of bulb is important. In general, use small bulbs. Big bulbs can look handsome from far off but may not look so good five inches from a visitor’s nose. For the same reason, take extra care in attaching the lights. After all, your visitors can see every scratched bulb or unsightly strip of electrical tape. If one bulb out of a row of 50 is pointing the wrong direction, people will notice. So double-check everything. Before you turn the lights on for the first time, ask a detail-oriented friend or neighbor to check them over. Some lights enthusiasts secure the lights only at the top and let them dangle freely. That can be a very pretty look, but it’s not a good idea if your doors and windows face outdoors and your area suffers strong winds. To make the lights as attractive as possible, consider using more than one line of bulbs. A lone strand around a doorway can look lonely and poverty-stricken, while multiple strands can look rich and luxurious. Besides, a large number of lights can distract the visitor’s eye from any small problems. This is, by the way, another reason to consider mini-lights, which come in greater numbers per inch than big bulbs. You can also use garlands. With a little diligent shopping, you can buy long garlands of light with bulbs entwined among fireproof artificial leaves. They look festive and Christmassy, and their plastic vegetation can hide a multitude of installation sins. If you hang multiple strands, keep them from touching each other. In particular, stagger hot components such as sockets and bulbs to keep them out of each other’s way. If you install window lights inside your home, keep them away from drapes and other flammable items. If you expect a lot of children to go in and out of a lit doorway, install the lights out of their reach; instead of putting bulbs around the door, you might hang lights from above it. If your strand of lights is outdoors, connect it to an outdoor outlet; if it’s indoors, connect it to an indoor outlet. Don’t run its electrical cord through the doorway or window. Shutting a door or window on a cord can crimp and damage it. Now, your only problem is making sure that your indoor décor looks as great as the view from outside!